"After several locals are viciously murdered, a Louisiana sheriff starts to suspect he may be dealing with a werewolf." 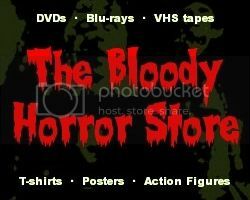 "Moon of the Wolf" is yet another public domain staple that turns up in nearly every budget horror DVD pack. I have this on several Mill Creek DVDs and a quite nicely produced EastWestDVD "Double Feature" with "Snowbeast" (1977). The only difference on the EastWestDVD is that Geoffrey Lewis gets the third place credit instead of Bradford Dillman which is only fair since he is the much more internationally recognisable star thanks to "Salem's Lot" and many Clint Eastwood movies. All the actors in this TV movie were pretty famous at the time. If you ever watch reruns of American TV shows from the '60s and '70s, you'll see their faces cropping up all over the place in a variety of roles. Some of them are still going today. I've only seen the late David Janssen in various cowboy, police and soldier roles before and he always seemed to play the same part. He could be in any uniform and still be all grumbly and mumbly. I'm not sure that he was dressed appropriately with his shirt unbuttoned nearly all the way to his navel in every scene but I was grateful that his voice was the most decipherable when the poor sound quality of this obviously VHS to DVD transfer made parts of the murder investigation hard to follow. Since his character doesn't really deserve anything further than the routine performance he gives here, I'd have to say that he was still pretty convincing in the sheriff role. 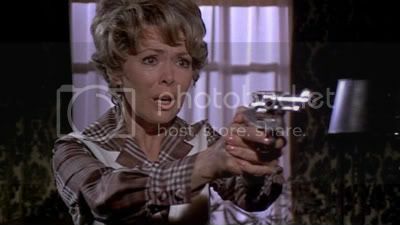 Barbara Rush, on the other hand, ranges from quite exceptional to absolutely awful to watch. She's very, very pretty in spite of her massive, uncomfortable-looking hair and hideously unattractive '70s clothes that make her look pear-shaped. She also doesn't seem to be able to run in those "old lady clothes" either. She has some of the worst reactions and annoying line delivery that I've witnessed outside of a soap opera. I'm assuming that she must have been a soap star at some point since I really don't know that much about her. Soap stars and good acting just don't really go together very often though. I'm not sure if there is supposed to be some kind of romantic thing going on between her character and David Janssen's since there is no chemistry there whatsoever. As for the others, Bradford Dillman doesn't really convince me either of his class or as being a werewolf though his make-up for the latter part is truly terrible. Geoffrey Lewis is the same as always and no different to his character in "Salem's Lot". I think he was often typecast. A lot of time is spent on all their characterisation though as the story is 99% police thriller with 1% werewolf. It's a murder mystery more than a horror movie but it just turns out that the killer is a werewolf. There isn't even any action apart from 2 minutes before the end and that is only to fire off some silver bullets and burn a barn down. It's no more boring than an episode of "Murder She Wrote" but it won't satisfy a horror fan. Even though a story like this might not have been out of place with something like "Kolchak, the Night Stalker" it still wouldn't have been a very memorable episode. I don't think you could even say that there was a real twist to the ending either which is pretty much necessary even for TV. It's all very predictable stuff and if you can't guess who the werewolf will be from the moment you first see him then there really is something wrong with you. It is so telegraphed that the killer might as well have a glowing sign attached to him saying, "I'm the werewolf, please shoot me at the end of the movie!" I don't think this a completely terrible movie though. If I had been born at least a decade earlier then I probably would have enjoyed watching this myself one night as a youngster. Unfortunately I am of the age where "Thriller", "Beasts", and "Salem's Lot" are more fondly remembered especially since they were all actually scary. "Moon of the Wolf", unfortunately, is not scary or memorable in any way.